Gradually, all the major components of the Bus Reform Initiative of the Lagos State Government conceived and being implemented by the Governor Akinwunmi Ambode-led administration to revolutionize public transportation and usher in ease of connectivity within the State, are beginning to crystallize. Under the initiative, 5,000 new buses are expected to be added to the public transport system, while aside the Intelligent Transport System mechanism of the program which will aid Lagosians to plan their journeys, other features of the scheme such as modern bus terminals, bus depots, bus stops and segregated lay-bys are already springing up in strategic locations across the State. In the pictures below, new modern bus stops are already adorning various parts of the State in line with the vision of Governor Ambode’s administration to ensure that all Lagosians have access to a proper and efficient public transport system compared to anywhere in the world. Speaking on the project, Permanent Secretary, Lagos State Ministry of Transportation, Dr Taiwo Salaam said apart from going a long way to ensure that transport activities are conducted in a safe and comfortable environment, the modern bus stops would also ensure free-flow of traffic as there would no longer be any disruption to vehicular movement. He listed features of the bus stops to include comfortable bus shelter, lay-by, lighting, walkways, guard-rails, wire-mesh fencing for pedestrian protection and passenger information system, among others. 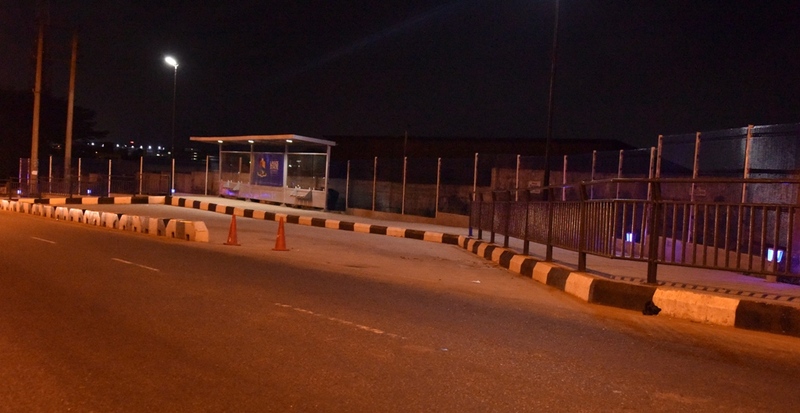 Bus Shelter at Allen Avenue built by Lagos State Government.